Great music and fun are traditions of the Harness Racing Museum & Hall of Fame’s annual Holiday Concert. Celebrating its 44th year, this community event kicks off the holiday season. Laced with the jingle of sleigh bells and the warmth of gathered friends and neighbors, the evening is sure to help “make the season bright.” So mark your calendars for Thursday, December 6, 2018 at 7:00 p.m. and don’t miss out. 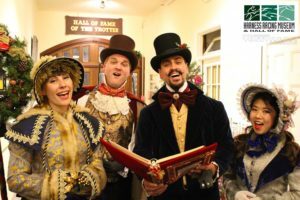 Returning to the concerts line up this year are the Yuletide Carolers, a professional authentically costumed Victorian quartet, from New York City, dedicated to bringing song to all who gather. Sponsoring the Carolers again this year is Robert Boni of Northwood Bloodstock in memory of John A. Cashman, Jr.
Goshen High School’s Varsity Choir and Jazz Voices Ensemble will return for their 19th annual appearance on this special night. The evening will end with the concerts traditional audience participation number, “The Twelve Days of Christmas” followed by refreshments in the Carriage Room. Reservations are welcome but not required, seating is limited and accommodated on a first come first serve basis, so arrive early to enjoy our holiday tree trimmed with horsey ornaments and tour the Museum with its festive halls and stalls. Don’t forget to visit the Museum’s Winner’s Circle Gift Shop for a little holiday shopping too. Concert goers and shoppers will enjoy a 10% discount prior to the show. Concert admission is $3.00 per person, and is waived for Museum members. Non-members who bring a new unwrapped toy for the Marines’ “Toys for Tots” program receive a $1.00 admission discount. The U.S. Marine Corps Reserve Toys for Tots Program distributes toys as Christmas gifts to needy children in the community. If you are unable to attend the concert but wish to join the Marine Corps efforts, we invite you to drop off a new unwrapped toy in the Museum’s main lobby from now until Tuesday, December 18 between 10 a.m. and 4 p.m. Tuesday through Sunday. Help make a child happy this holiday season! If you have not booked your holiday party, there are a few dates still available. Call Gigi Ryan for details about this unique setting for all your special occasions at 845-294-6330. The Harness Racing Museum & Hall of Fame, located at 240 Main Street in Goshen, NY, is open Tuesday through Sunday from 10 a.m. – 4 p.m. There is no charge for regular admission, thanks to the members of the U.S. Trotting Association. For further information on the holiday festivities and the Harness Racing Museum & Hall of Fame, its services to the sport and the local community, please call (845) 294-6330 or visit www.harnessmuseum. This entry was posted in Community, Marketing, News, Nonprofits. Bookmark the permalink.